A narrow lot can be quite stressful to look at especially if there are so many things in it and there’s so much more you want to put in it. Today, this article can be your savior for making your small lot look wider! We can help and give you hacks on expanding the view and maximizing the space of your skinny lot with a bonus of having a place to relax. This one is the first on having your eye tricked into thinking that your space is wide by having a curve path and putting some plants in the pathway. You can have stone paths along a circular loan where it appears larger than it is. • Dividing the space for different uses. 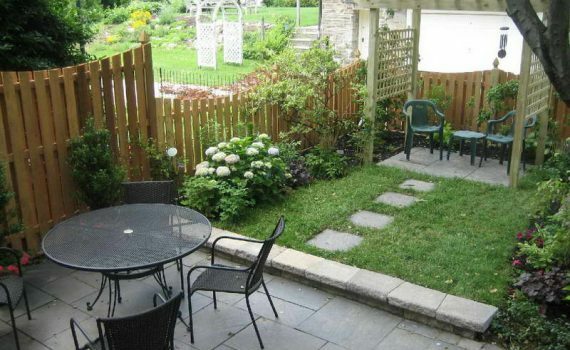 You can split your backyard into smaller sections and have them assigned with a purpose. You can set a space where you can install a soccer net and trampoline for your kids. You can have a tiled courtyard where you can have coffee outside in the morning, and whatever you want it to be. You’ll know that having a narrow space won’t stop you from doing what you want in your house. • Maximize your growing space. If you are a green thumb, probably you’ll think that you can’t do it as much as you want if you have small space. But the good news is you can maximize the space where you can plant. You just have to search for ways to increase your planting opportunities without taking up the floor space. You can do it in your living wall, add trellises on your fences, raise planting beds and better yet, find a tall and skinny container to plant as it won’t take much floor space. • Make the seating and storage built-in. This one has many advantages as you can have you seats, tables, and storage customized without experiencing the fitting of the purchased furniture in your narrow lot. Have a small dining table and built-in floating seats and put some lights on it.